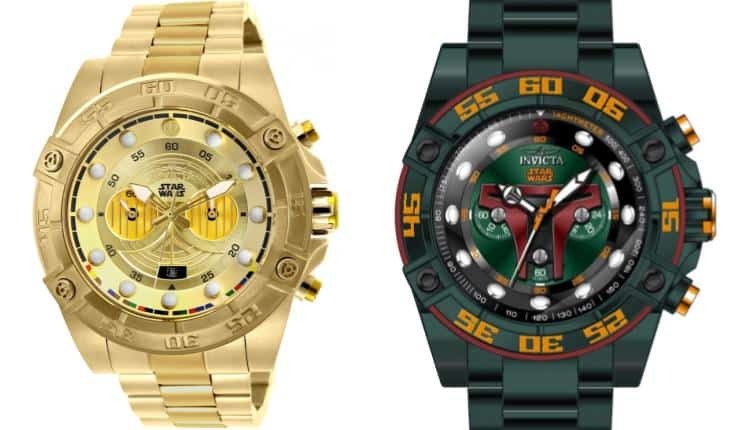 Invicta Star Wars Watches: Boba Fett and C3PO | Nerd Much? Each watch takes the most iconic aspects of a Star Wars character. If you happen to have money to burn or just looking for a very special gift for a special someone, these Invicta Star Wars Watches are for you. Each Invite watch is made from top quality material, carefully crafted, and uniquely designed. The design of each watch are some of the most creative on the market. Each watch takes the most iconic aspects of a Star Wars character, takes it apart, and puts it back together in the shape of a watch. C3PO, for example, has his iconic gold eyes reflected in the two inner dials of the watch face. Even the logos are other dials are carefully placed to look like a brow, nose, and mouth. Or the Boba Fett watch that combines those iconic colors of green, orange, and red on the watch face and band. Boba Fett’s helmet is carefully laid in the inner most dial, as if on a display stand. Even the clock hands are in the shape of the pack Boba Fett wears on his back. This particular one comes in a metal band or a rubber one, depending on your preference. My favorite in terms of design, however, is the Darth Vader watch. At just a glance, you can tell who the watch is meant to depict, yet the real detail comes on closer inspection. Within the sea of black on black is the very subtly designed shape of Vader’s helmet. The red line and dot helpfully divide the helmet at the brow, to better help the eye find the two eyes and nose. The nose, by the way, even has little metal bars to depict the same on the original. A small detail, but a very notable one. Each watch is made of stainless steel and aluminum to keep the weight from being too heavy. They are not explicit on how they get the gold collar, but the method is described as “a unique gold layering technique.” If the quality is to reflect the cost, then whatever this technique is, it should last a long time. If it does not, however, you can buy replacement bands on the site. Follow the link below to take a look at more of the Star Wars collection, and be sure to check out the Marvel line too if you’re interested.